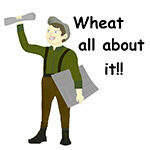 5.8.20 In Episode 72 of Wheat All About It! entitled, Spring seeding with the WGC’s Mike Carstensen, join Scott Yates, director of communications and producer relations for the Washington Grain Commission, as he talks with one of the newest members of the board. Carstensen covers an array of issues including wheat quality, falling numbers, the impact prices have had on farmers over the last decade and how he markets his grain–all while seeding! He also speaks frankly about his recent travels to China and Taiwan where the message he received from millers and bakers was loud and clear. Access the podcast at the WGC website at wagrains.org or subscribe on iTunes, Overcast or Pocket Cast. Connect by Wi-Fi or a four bar cellular link for quick downloads which can be listened to later on your smartphone in the tractor, truck or easy chair.